HUMBOLDT – On Monday, May 14, 2012, Leon Alyious Bigleggins, 27, of Willow Creek, pleaded guilty to voluntary manslaughter and felony child abuse resulting in death. Both counts included great bodily injury enhancements inflicted on a child under five years of age. 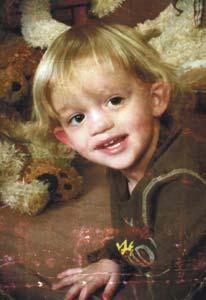 On July 24, 2010, a four year old boy, hereafter referred to as John Doe [real name: Dylan Blount-Chambers – Ed.] was brought into Mad River Hospital after he had stopped breathing. After failed attempts to resuscitate him, the child was pronounced dead by Mad River Hospital medical personnel. While attempting to resuscitate Doe, medical personnel noted extensive bruising over his body and notified the Department of Health and Human Services and Law Enforcement. The Arcata Police Department arrived and secured the scene and body until the Humboldt County Sheriff’s Department arrived. On arrival, the Humboldt County Sheriff’s Department determined there was reason to suspect that child abuse may have caused the child’s death. A subsequent autopsy revealed that John Doe died of blunt force trauma to the head and abdomen, the later leaving a torn intestine which resulted in sepsis. Further investigation revealed that Doe had been in the care of his grandmother and Leon Bigleggins for at least two weeks prior to his death. Through investigation, Doe’s fatal injuries were attributed to Bigleggin’s treatment of the child and the defendant was charged with murder, child abuse and assault on a child causing death. The grandmother was not charged. The trial was set to begin on Monday, May 14, 2012. At that time, Bigleggins agreed to plead guilty to voluntary manslaughter, which is the voluntary killing of a human being without malice but with great bodily injury, and child abuse causing great bodily injury. This plea was submitted on the basis that the defendant did, in fact, inflict great bodily injury on John Doe resulting in his death but the killing was without premeditation and/or malice. The defendant agreed to be sentenced to 18 years and four months. Both offenses are serious and violent, qualify as strike offenses and will require the defendant to serve at least eighty-five percent of his prison sentence. In addition, the defendant agreed to waive any and all appellate rights associated with the case and the plea. Gallegos also extended deep appreciation to all the agencies and medical personnel involved in the case. “These cases are incredibly difficult for first responders. The Arcata Police Department, Sheriff and Coroner’s Office as well as the Mad River Hospital personnel and cooperative witnesses facilitated the gathering of the evidence needed to resolve this case,” he added. The defendant is scheduled to be sentenced on June 8, 2012 by the Honorable Judge Timothy Cissna. This entry was posted on Tuesday, May 15th, 2012 at 2:08 pm	and is filed under News. You can follow any responses to this entry through the RSS 2.0 feed.